A native of the Midwest, violinist Jonathon Winter has performed as solo, chamber, and ensemble musician across the United States and Europe. Recently, Jonathon has performed with the Joffrey Ballet, Palm Beach Symphony, AIMS in Graz Festival Orchestra, and has performed as soloist with the Oneota Valley Orchestra and the Eurasia Chamber Orchestra of Berlin. 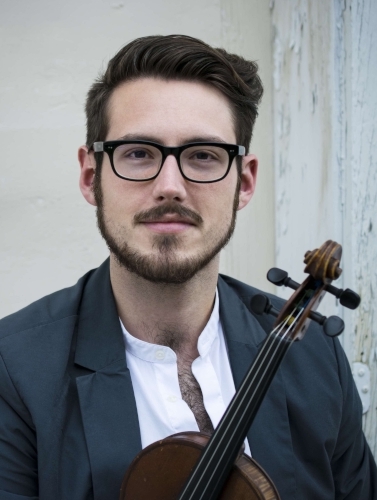 He has performed in masterclasses with Kathrin ten Hagen, Henning Kraggerud, Judith Ingolfsson, and Zakhar Bron, and has attended the Euro Music Festival and Academy, Green Mountain Chamber Music Festival and the Castleman Quartet Program. Equally comfortable as a studio musician, Jonathon has recorded with Jorge Mejia for Sony Music, jazz singer Patti Austin, and has performed with major artists such as Jeff Beal, Kristin Chenoweth, and John Williams, among others. Also an emerging educator and formally trained as a Suzuki Method teacher, Jonathon has a studio of young violinists ranging from ages 3-16 at the Frost Preparatory Program in Coral Gables, Florida. Jonathon currently lives in Miami, where recently graduated from University of Miami Frost School of Music as a student of Charles Castleman.